Yesterday was about baseball. 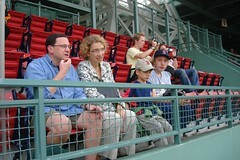 Our host Matt is a devoted fan of local team The Boston Red Sox and has been since he – like all good American litterary heroes – as a little boy was taken to the stadium on hot Saturdays by his father. 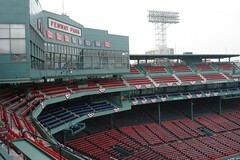 Matt took us on a tour of the old (1912) stadium Fenway Park in the middle of Boston, and it was great fun to get an insight in this sport, which you invariably come across if you ever watch an American film, read an American book or browse an American newspaper. The weather was lovely and the female guide far above average as American guides go, she clearly wasn’t paid on a words-per-minute basis. 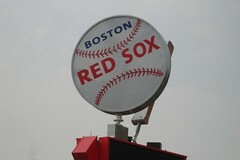 We browsed around the Red Sox merchandise shop, approximately the size of a middlesized supermarket back home. There really is no end to the fan gear you can purchase there. And there’s something in the air that really makes you want to buy the stuff, heavily overpriced as it is. We resisted the urge, having already received Red Sox-stuff as presents from Matt and Jackie and having bought a few caps and a t-shirt earlier in the day at Wal-Mart at a far lower price. 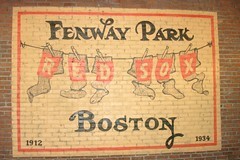 The air was heavy with anxious anticipation, because later that evening The Boston Red Sox were playing a very important game in Cleveland, Ohio, determining their fate in the series. They’d apparently done pretty badly in the previous games, so spirits were a bit low. But lo and behold if they didn’t win! For David, Dane, Emil and me it was our lives’ first baseball game and it was fun to watch it in the RV, eating crisps and drinking beer. Dane fell asleep after a while and a little later also Emil. I couldn’t fall asleep, since my seat was so bl…. uncomfortable, and I could surf a little and read a little during all the commercials (which really is what kills you) and David almost managed to sit through it, only dozing off during commercials. As David put it, half of the commentary was double dutch to us, but the general idea of the game dawned on us. And we had to admire the Red Sox pitcher who saved the game. He was SO cool! Watching him chew his gum, spit, look completely stonefaced and then throw the ball with astonishing speed and curve, so the Cleveland Indians practicallly never hit it, was absolutely worth the sore bum I had afterwards. If any Americans with baseball knowledge read this: What is it with the spitting? They all do it – all the time. The coach more so than any of the others. What on earth is it good for? Today it’s really warm, but raining. The boys have gone fishing again, I’ve been reading Vanity Fair, a luxury I’m warming to considerably. Compared with your average monthly fashion magazine, it certainly takes a long time to read! OK, the print is very small and clearly not intended for middle-aged women with bi-focals. And the language is not exactly easy. But, wow, it’s rewarding once you find the peace and quiet to read it. I read a hair-rising story about the involvement of a Halliburton subsidiary in the Iraq war. It was so well researched, and so disquieting! The American tax payers certainly have reasons to worry! It really doesn’t matter if you’re for the war or against it. Nobody can be in favour of private companies overcharging the American government by a routine 500-1000% for services rendered? If you have the patience to read 8 pages online, start here. There’s also an article by Christopher Hitchens of whom I’m not usually a fan. But this one is good and strangely touching. The Shakespeare quote towards the end certainly provoked a few tears. The article is about how Hitchens finds himself partly responsible for the death of a young man in Iraq and how he deals with this emotion. Pretty good.